Entrepreneur and working mum, Tiffany set up TWVA in 2016 from her home office in Buckinghamshire. Tiffany has always been incredibly ambitious and dedicated to her work. She was offered her first business partnership at 17, with a second following just a year later. However, both were turned down in her pursuit to become a PA. She went on to graduate from Lucie Clayton Secretarial College in 2001 and quickly gained a reputation as a top-level PA/EA within central London, working for a number of large organisations within the financial services, banking, private equity and consumer services sector including companies such as Merrill Lynch and The AA. 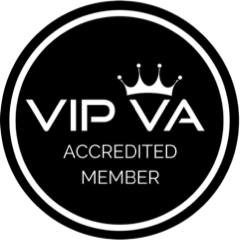 Outside of TWVA, Tiffany has recently joined the VIP VA Advisory Board as a Non-Executive Director and has also recently been elected as a Parent Governor at her son’s primary school. She also enjoys walking her cockapoo Denzel (when he’s not asleep in the home office), grabbing a bite to eat with friends and boxing (don’t worry, the gloves are left at the gym). Natalie started her Virtual Assistant career in 2016 after spending 12 years’ in the corporate world working in various administration positions. She spent her entire career working remotely to her managers and colleagues so the transition to become a VA was a natural one. Natalie has a Secretarial Diploma, has completed the Hemsley Fraser Senior PA Professional Development Programme, is a member of the Society of Virtual Assistants and an Accredited Member of VIP VA. These days she is in her element when working with Clients on their marketing, accounts or playing around with different systems. She is also our resident MailChimp expert! Felicity is our social media guru and excels in all areas of social media including management of channels, content creation and curation, research and copywriting for blog articles. Felicity has been a Marketing professional for 10 years in roles such as Online Marketing and Social Media Manager for a large UK corporation. Having been a marketing professional for 10 years in various positions within a large UK corporation, Felicity has developed a wealth of experience in marketing and business operations and has created and executed successful campaigns for a variety of industries. In addition, Felicity has a Diploma in Business Administration and an ILM Level 5 Qualification in Leadership & Management and provides excellent all-round VA support. Felicity isn’t afraid of technology and loves to own the latest gadgets and she thrives on keeping abreast of new industry trends.